Morristown, Nj, January 19, 2015: Villa Enterprises Management, Announced Bananas Restaurants Have Introduced A Green Smoothie, A Delicious Mix Of Spinach,Banana, Vanilla Nonfat Frozen Yogurt And A Touch Of Honey. The New Smoothie Joins The Menu At All 37 Locations Today For A Limited Time. 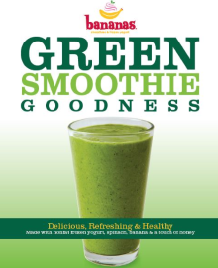 “Guests don’t have to feel guilty and can keep those New Year’s resolutions at Bananas by enjoying the new Green Smoothie filled with nutritious goodness,” said Andrew Steinberg, Senior Vice President of Business Operations, Villa Enterprises. Consumers today are seeking on-the-go nutritious, vitamin packed options. Keeping up with the growing trend, Bananas new Green Smoothie is packed with fiber, which can lower cholesterol and glucose levels, and keeps one feeling fuller for longer. Plus, it’s a tasty way to get a strong dose of fruits and veggies, which provide the body with vital nutrients like vitamin A, vitamin C, foliate and potassium. “With its numerous health benefits and great taste, Bananas’ new Green Smoothie is sure to be a popular menu item,” said Steinberg. Whether in a cone, cup, sundae or smoothie, Bananas uses nonfat frozen yogurt and fresh ingredients, to make all their delicious combinations. Real fruit smoothies and good-for-you snacks, meal replacement options, as well as nondairy fruit frosties, nonfat frozen yogurt sundaes, fresh squeezed juices, and a variety of natural grab-n-go snack offerings, round out the menu. Villa was founded 50 years ago, and built its business on the strict loyalty to authentic old-world recipes that Michele Scotto brought with him from Naples, Italy in 1964. From the first pizzeria that opened in 1964 next to the Ed Sullivan Theater on Broadway in New York, to their Bananas restaurants, and more than 370 restaurants today, that commitment to quality food and genuine hospitality is still the hallmark of Villa. Villa Enterprises is a global multi-brand restaurant operator and franchisor. Founded in 1964 by Michele Scotto, a Naples, Italy native, Villa Enterprises began as a small pizzeria next to the Ed Sullivan Theater in New York City. Today, Villa Enterprises is an international organization celebrating its 50th anniversary with more than 370 quick-serve restaurants in malls, airports, casinos and other high-traffic locations. Villa’s QSR brands, including Villa Italian Kitchen, Green Leaf’s, Bananas, South Philly Steaks & Fries and Far East, can be found across 40 U.S. states and eight additional countries. Villa also operates 12 full-service restaurants in suburban New Jersey under the 40North brand including The Black Horse Tavern & Pub, The Office, Steelworks Buffet & Grill, Piattino and George & Martha’s. For more information, please visit www.villaenterprises.com.